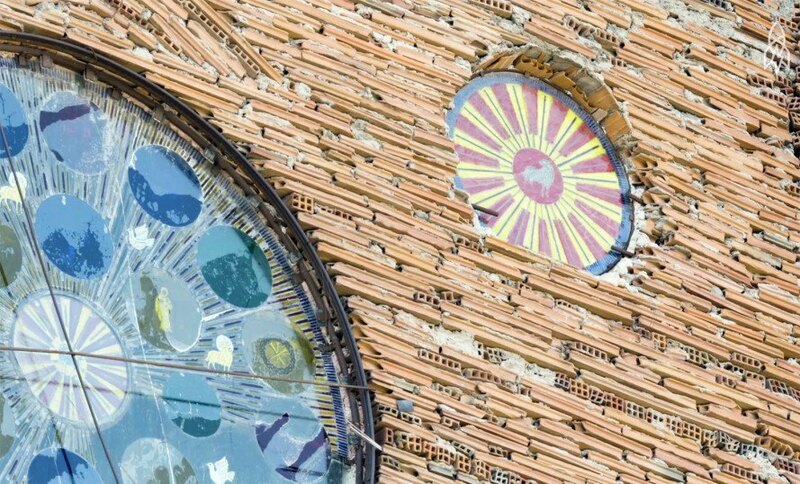 This extraordinary cathedral made from salvaged materials has steadily risen over the past 50 years in a quiet Madrid neighborhood. Justo Martinez (who goes by Don Justo) has been working on the massive undertaking nearly single-handedly ever since he had to leave an order of monks due to illness. After recovering, he dedicated his life to building a church using his own money, on his own land. The massive undertaking is built almost entirely from local materials that he is able to salvage, and now topped out at 131 feet the cathedral just needs a few finishing touches — like a roof, some windows and permits. A new video from Great Big Story tells the inspiring tale – watch it below! While the cathedral’s design is loosely based on St. Peter’s Cathedral, Don Justo has created no formal drawings or engineering plans. His background in farming did not stop him from taking on such a challenging project, which incorporates motifs found in castles, churches, and even the White House. Most of the bricks are salvaged from nearby brick factories, and cathedral’s walls are certainly unorthodox. After leaving life as a farmer to become a Benedictine Monk, Don Justo came down with tuberculosis which forced him out of the monastery in a greatly weakened state. He promised himself that if he survived he would erect a church dedicated to the Lady of The Pillar who he prayed to during that turbulent time. So far the cathedral totals an astonishing 8,000 square meters. The many concrete support columns use old oil drums as forms. The roof is adorned with countless tons of salvages bricks and locally-salvaged tiles, and paint buckets sprout from the towers. Donated materials make up the bulk of the rest of the construction. He gets some help with the labor from his nephews and an assistant. While the building has neither plans nor permits, the City of Madrid has tolerated its existence. Martinez is in the process of consulting with an architect to formally apply for a permit so that when the building is closer to completion it may be used as a house of worship. Don Justo’s dedication will surly inspire others through this bold and committed endeavor. wow! that's amazing as an artist making art out of trash is also my passion. Great man and inspiring work. Idle hands are the Devil's playthings! This is awesome. Simon Luria and the Facteur Cheval still live, to say nothing of Gaudi. St. Peter's is not a cathedral, either. It's a basilica. Important. This is Not a Cathedral. A Cathedral is the home church of a Bishop. This is real and wonderful architecture. I wish I could help him. A tribute to the human spirit, and what one man can do with intention and determination. An inspiration to us sluggards. This extraordinary cathedral made from salvaged materials has steadily risen over the past 50 years in a quiet Madrid neighborhood. Justo Martinez (who goes by Don Justo) has been working on the massive undertaking nearly single-handedly ever since he had to leave an order of monks due to illness. After recovering, he dedicated his life to building a church using his own money, on his own land. 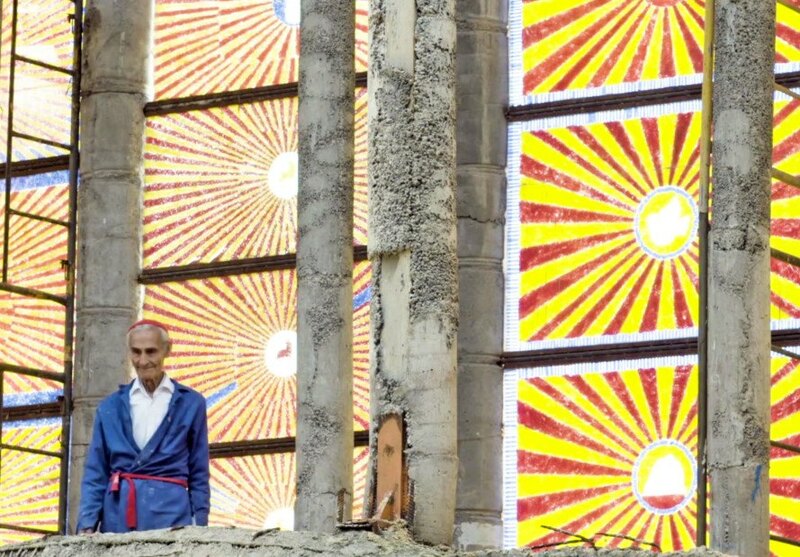 The massive undertaking is built almost entirely from local materials that he is able to salvage, and now topped out at 131 feet the cathedral just needs a few finishing touches -- like a roof, some windows and permits. A new video from Great Big Story tells the inspiring tale. While the cathedral's design is loosely based on St. Peter’s Cathedral, Don Justo has created no formal drawings or engineering plans. His background in farming did not stop him from taking on such a challenging project, which incorporates motifs found in castles, churches, and even the White House. Most of the bricks are salvaged from nearby brick factories, and cathedral's walls are certainly unorthodox. After leaving life as a farmer to become a Benedictine Monk, Don Justo came down with tuberculosis which forced him out of the monastery in a greatly weakened state. He promised himself that if he survived he would erect a church dedicated to the Lady of The Pillar who he prayed to during that turbulent time. So far the cathedral totals an astonishing 8,000 square meters. The many concrete support columns use old oil drums as forms. 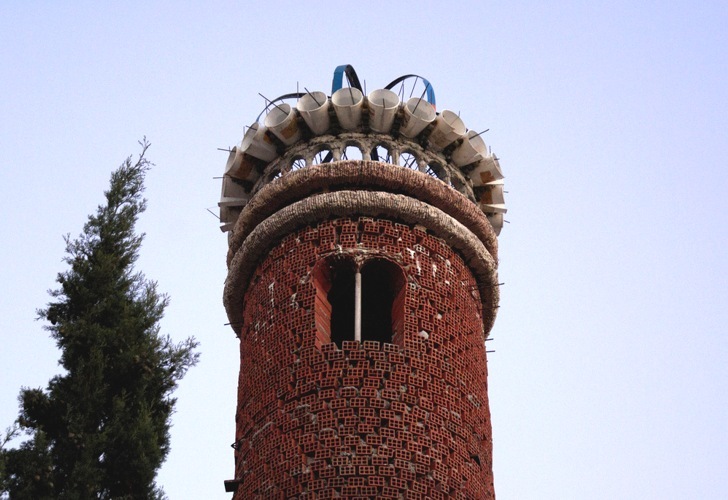 The roof is adorned with countless tons of salvages bricks and locally-salvaged tiles, and paint buckets sprout from the towers. Donated materials make up the bulk of the rest of the construction. He gets some help with the labor from his nephews and an assistant. While the building has neither plans nor permits, the City of Madrid has tolerated its existence. Martinez is in the process of consulting with an architect to formally apply for a permit so that when the building is closer to completion it may be used as a house of worship. Don Justo’s dedication will surly inspire others through this bold and committed endeavor. So far the cathedral totals an astonishing 8,000 square meters. 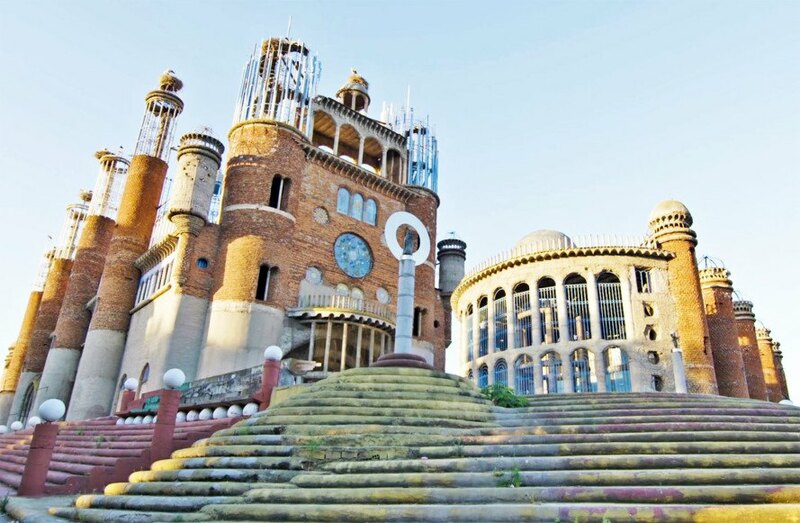 This extraordinary cathedral made from salvaged materials has steadily risen over the past 50 years in a quiet Madrid neighborhood. 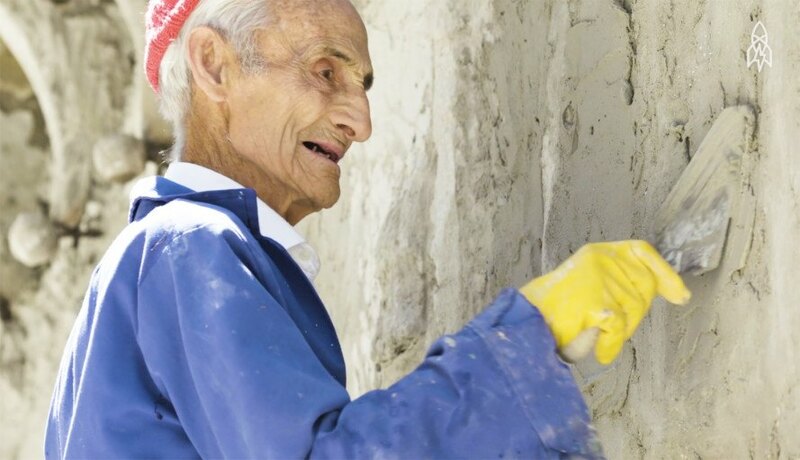 Justo Martinez (who goes by Don Justo) has been working on the massive undertaking nearly single-handedly ever since he had to leave an order of monks due to illness. After recovering, he dedicated his life to building a church using his own money, on his own land. The massive undertaking is built almost entirely from local materials that he is able to salvage, and now topped out at 131 feet the cathedral just needs a few finishing touches -- like a roof, some windows and permits. A new video from Great Big Story tells the inspiring tale - watch it below!